It’s hard to believe that Spymaster is the eighteenth in the Scot Harvath series. Harvath finds himself pulled in many directions as the poor health of his boss and mentor necessitates more time at base while world events involving the assassinations of NATO officials pull him to the field. Though not “ripped from the headlines” this thriller seems to highlight some of the NATO issues currently being debated in the world. Can Harvath and his colleagues keep America from being pulled into a world war that no one except for an evil empire? Harvath’s mission is simple; keep the United States out of war! This novel didn’t have the level of suspense of the usual Scot Harvath books. I didn’t find myself awake late at night unable to put the book down. That doesn’t mean that this was still wasn’t and excellent book. Unfortunately Mr. Thor set the bar very high for this series. My only visceral dislike was that the novel ended with a serious cliffhanger. I deplore them in a novel and am disappointed in this one. This article was published on Aug 11, 2018 . 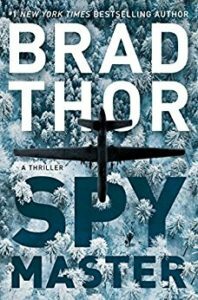 It is tagged brad thor, scot harvath, spymaster. You can follow any responses to this article through the comment RSS feed.